Packages start at just $10 a month! New to Steel on Steel? Get a Free Trial! 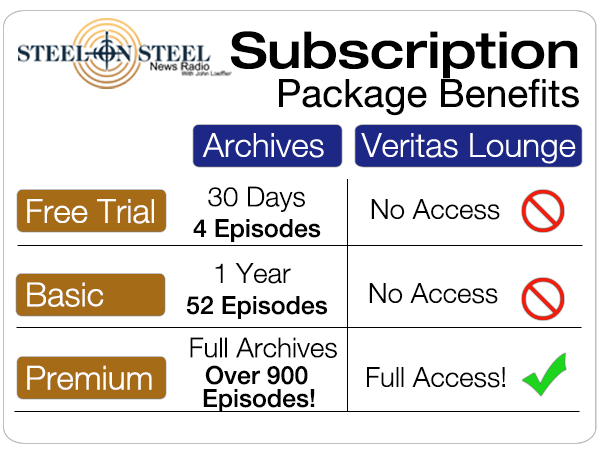 Listen immediately to the full-length, ad-free show and the past month of archives, as well as 30 days of future Steel on Steel broadcasts; free of charge, no obligation, no credit card necessary. Just enter your email address below and we’ll send you a password to login. Get 30 Days of Steel on Steel broadcasts and archives. You may not sell any portion of the materials found on this site or any other outlet of Steel on Steel. Copies of material found on Steel on Steel may be reproduced free of charge for educational purposes. Your subscription may be cancelled at any time if suspected of fraud or theft of copyrighted material. and you will be able to instantly login.